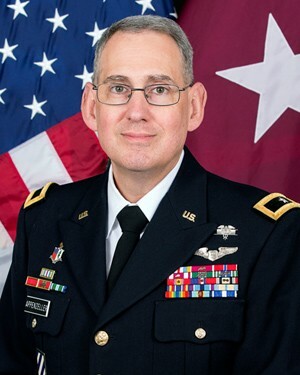 Brigadier General George (Ned) Appenzeller currently serves as the Commanding General, Brooke Army Medical Center; Deputy Commanding General, Regional Health Command-Central; and Market Manager for the San Antonio Military Health System. He attended Tulane University with a Reserve Officer Training Corps Scholarship. Upon graduating with a Bachelor’s Degree in biology, he was commissioned a 2LT in the Medical Service Corps. BG Appenzeller attended the Medical University of South Carolina under the Health Professions Scholarship Program, and after completing an Internal Medicine Internship at the Medical University of South Carolina, he spent two years at Fort Sill, OK, as the Chief of the David B. Bleak TMC serving the U.S. Field Artillery Training Center. In June 2008, he was assigned as the Deputy Commander for Clinical Services at Winn Army Community Hospital, Fort Stewart, Georgia. He commanded U.S. Army Medical Activity-Alaska from June 2010 to June 2012, prior to attending a U.S. Army War College Fellowship at the U.S. Department of Veterans Affairs in July 2012. 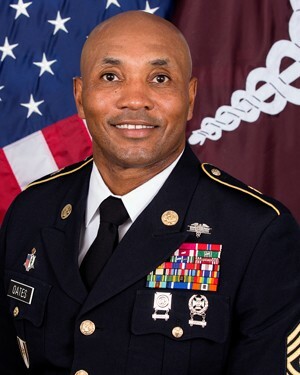 He assumed command of U.S. Army Medical Activity-Ft. Campbell, KY, and Blanchfield Army Community Hospital in July 2013, and served as Command Surgeon, AFRICOM, in June 2015. Prior to this assignment to BAMC, BG Appenzeller served as Deputy Commanding General, Regional Health Command-Pacific, JBLM, WA. BG Appenzeller is board certified in Emergency Medicine. Command Sergeant Major Thomas R. Oates currently serves as Command Sergeant Major, Brooke Army Medical Center. He has served in a variety of assignments including: Womack Army Medical Center 2 tours; 558th Ground Ambulance Company (Camp Humphrey’s Korea); Victory Brigade Fort Jackson SC; 3rd BN 7th Infantry Division (Fort Stewart GA); Fox Army Health Center (Redstone Arsenal); Headquarters and HQ Detachment 56th Multifunctional Medical Battalion, 602nd Area Support Medical Company, Headquarters and Headquarters Detachment 1st Infantry Division, Reynolds Army Community Hospital Fort Sill OK, and 32nd MED BDE, JBSA. His operational and combat tours include Kosovo in support of KFOR 7A, Multinational Force and Observers, Sinai Egypt; Operation Iraqi Freedom and Operation Enduring Freedom. CSM Oates has served with distinction in all enlisted leadership positions from Squad Leader through Command Sergeant Major. His positions of increased responsibility include Line Medic, Team Leader, Squad Leader, Platoon Sergeant, Detachment Sergeant, NCOIC of Primary Care Clinic, Plans and Operations Sergeant, First Sergeant, Senior Medical NCO, Chief Medical NCO, and Command Sergeant Major. CSM Oates military education includes but is not limited to Warrior Leader Course, Instructor Trainer Course, Advanced Leader Course, Senior Leader Course, First Sergeants Course, Basic Healthcare Administrator Course, Master Resilience Trainer Course, AMEDD Executive Skills Course, the Joint Medical Executive Skills Institute and The United States Army Sergeants Major Academy. His civilian education includes an Associate of Arts degree in General Studies and a Bachelor of Science degree in Business Administration from Columbia College of Missouri. He also holds a Master of Arts Degree in Human Resource Management from Webster University. Combat & Casualty Care had the opportunity to speak with the Commanding General and Command Sergeant Major of Brooke Army Medical Center (BAMC), Ft. Sam Houston, TX, regarding BAMC efforts to facilitate the DoD medical community’s transition to Defense Health Agency oversight of an integrated healthcare network. C&CC: Please speak to your roles as BAMC Commander and Command Sergeant Major, and present mission focus. BG Appenzeller: CSM Oates and I are blessed to be allowed to serve the patients and staff of Brooke Army Medical Center. Brooke is a premier joint medical “live fire” training platform that exercises our medical battlefield operating systems daily. The nearly 9,000 Army, Air Force, Navy, Public Health Service and civilian staff are focused on the high-quality, safe, accessible care all our beneficiaries deserve, while ensuring our service members are ready to deploy and we are ready to care for them both at home and abroad. We believe 2019 will be a year of change as we look to transition to the Defense Health Agency. This transition is mandated by the 2017 National Defense Authorization Act to improve access to quality care for beneficiaries while enhancing readiness. Our focus will be on leveraging the opportunities these changes bring to enhance our core mission: supporting the warfighter and caring for our patients. CSM Oates: Maintaining our mission and vision is a vital part of our future. We protect the nation by ensuring Total Force Readiness through innovative, safe, accessible, high-quality healthcare and the development of elite healthcare professionals. By doing this, we will be the pinnacle of military healthcare, anytime, anywhere. C&CC: From a current day trauma care treatment perspective, can you discuss some focus areas at BAMC? CSM Oates: BAMC is the DoD’s only Level I trauma center. Our trauma capability is vital to the clinical and operational readiness and training of our doctors, nurses, and other medical professionals. We deliver high-quality trauma care to 22 counties in southwest Texas. Without this mission, it would be difficult for our active duty medics, nurses, blood bank, radiology, surgeons, etc., to maintain readiness for the deployed mission. The premier military research institute, the U.S. Army Institute for Surgical Research (USAISR), is literally next door and there is a lot of cross-pollination between the two institutions. The resuscitation strategy for bleeding patients changed about 10 years ago because of work that was done at the USAISR and carried out by BAMC surgeons. We are now one of a few hospitals in the country that are transfusing low titer group O whole blood (LTOWB) to trauma patients as our deployed battlefield facilities do the same. BG Appenzeller: The BAMC Trauma Center is a key player in melding the lessons of battlefield surgical care with civilian surgical treatment. BAMC Ortho Trauma is involved in over 12 multicenter studies in conjunction with the Major Extremity Trauma and Rehabilitation Consortium (METRC). METRC is a 43-hospital research organization that has brought groundbreaking treatment to the orthopedic community for the treatment of infection, mangled limbs, blood clot prevention and pre-hospital stabilization. BAMC is the lead military treatment facility for the San Antonio Uniformed Services Health Education Consortium SAUSHEC, which trains over 600 physicians (from Army, Air Force, Navy, and the Public Health Service) across 37 medical specialties, including the only surgical critical care fellowship in the DoD. Graduates from these programs take the lessons learned here and go on to serve as staff physicians at other military treatment facilities across the Military Health System and in operational units. BAMC is a leader in combat casualty care research, with 48 peer-reviewed publications from our Graduate Military Education (GME) faculty and residents on the topic in the last year alone. GME is the lifeblood of military medicine and our programs ensure appropriate clinical, educational and didactic exposure to trauma care in all GME specialties, promoting multidisciplinary readiness. C&CC: Can you highlight some efforts BAMC is undertaking to advance care for combat veterans with chronic or long-term rehabilitation challenges? BG Appenzeller: Our Center for the Intrepid (CFI) team is actively conducting research to advance care for returning combat veterans. Some examples include: participating in groundbreaking rehabilitation of patients with amputations using osseointegration; the formation of a direct interface between an implant and bone, without intervening soft tissue. The ability to “test drive” prosthetic feet with a simulator prior to fitting; using advanced tissue regeneration techniques to toughen residual limb skin and reduce sweating; improving the training of myoelectric upper extremity prostheses; employing novel trip training techniques to minimize falls after patients leave rehab; leveraging new technologies to enable the rapid collection of clinical outcome measures; defining the effect of new treatments for chronic pain. Physical therapy is implementing the Military Orthopaedics Tracking Injuries and Outcomes Network (MOTION) database to track outcomes of care. Rehabilitation professionals will be able to use the MOTION database to develop best practices and improve quality of care, improve outcomes, and create value. Concussion, or mild traumatic brain injury has been a common injury in returning combat veterans. The BAMC Brain Injury Rehabilitation Service (BIRS), in partnership with the Defense and Veterans Brain Injury Centers, completed the largest randomized controlled trial to date evaluating cognitive rehabilitation interventions for service members following in-theatre concussion. This study, the Study of Cognitive Rehabilitation Effectiveness (SCORE), included the development of nearly 1,000 pages of publicly available manualized treatment interventions. C&CC: In terms of specific program areas addressing robotic-assisted and other technological enhancements to procedural care, can you discuss any advances at BAMC? BG Appenzeller: Blood flow restriction (BFR) rehabilitation was developed at the CFI and is being used to help expedite recovery. BFR training involves decreasing blood flow to working skeletal muscles in order to promote hypertrophy and prevent disuse atrophy. Reduced blood flow creates a local hypoxic event which results in the accumulation of metabolites that regulate the anabolic response system during exercise. Rehabilitation experts and researchers utilize the Computer Assisted Rehabilitation Environment (CAREN) system to provide functional rehabilitation. The CAREN immerses patients in a versatile, multi-sensory virtual reality platform used for treatment and rehabilitation of human locomotion, or walking, as well as pain, posture, balance spinal stability and motor control integration. The prosthetic emulator project is a robotic prosthetic foot system that can be programmed to emulate any commercially available prosthetic foot and enable the patient to “test drive” a prosthetic foot before committing. Also, treadmill training exposes patients to trips and slips and trains them on techniques to avoid falls, is technically a robotic therapy. CSM Oates: The Firearms Training Simulator (FATS) provides rehab patients the opportunity for realistic firearms training without the external factors such as weather and limited resources. FATS puts wounded warriors through a series of dangers, testing their ability to swiftly react and fire on threats. FATS not only trains their hand-eye coordination, but also keeps patients current with weapons systems common to the military. As use of firearms is an integral part of military soldier tasks, using shooting as part of the care plan allows for both physical and psychological rehabilitation. BG Appenzeller: BIRS frequently incorporates technology into our rehabilitation programs, with resources including commercially-available smart phone apps, eye-tracking diagnostic tools, SmartHome technology, and a driving simulator. Soon, the BIRS will incorporate virtual reality into our programs, including its use in the management of post-traumatic stress disorder. C&CC: From a Joint partnering perspective, how is BAMC working with other Army/DoD medical entities in helping advance standard of care across the spectrum? CSM Oates: Our command is working across the MHS doctrine, organization, training, materiel, leadership and education, personnel, facilities, and policy spectrum to ensure quality trauma education, training and management. BAMC is spanning/organizing the numerous commands/training programs (i.e. BAMC, USAISR, AMEDD, Joint Trauma System, Defense Medical Readiness Training Institute, and Joint Trauma Education Training Directorate) into a centralized readiness training platform for all deploying military personnel. BAMC has the key components, most important being the trauma patient volume and acuity, and experienced medical personnel, to be the military’s premier training and readiness platform for deployment readiness and to prepare providers at all levels to support the operational units. Operating Room (OR) personnel are rotating through USAISR ORs for training. The goal is to have Air Force and Army rotate both nurses and technicians to USAISR ORs. We are directly partnering with the Air Force to integrate training opportunities and provide more cohesion between services. This helps standardize processes and gives some linearity to the chain of command and overall decision-making. BG Appenzeller: The MOTION, Pain Assessment Screening Tool, Outcomes Registry databases, and Activity and Mobility Promotion, are initiatives that will help standardize patient care throughout DHA. The BAMC BIRS routinely collaborates with experts from DoD, academia, and VA, both clinically and in research. All but one of our active research protocols include partners from places including VA medical centers in San Antonio, Tampa, and Utah; universities including Vanderbilt, Iowa, Delaware, and McMaster; and DoD medical treatment facilities around the world. One exciting study, Optimizing Rehabilitation Interventions for Cognition following Complex Traumatic Brain Injury (ORION), will leverage the large numbers of patients seen by multiple DoD institutions and the depth of expertise from the treating providers in order to advance the science more quickly than can be done in randomized controlled trials. This study uses advanced statistical modeling through the VA’s Utah data center in order to develop practice-based evidence (i.e. evaluating what we do with hundreds of patients in thousands of encounters to see what really works pragmatically rather than trying one idealized intervention on a couple of dozen patients at a time as is generally done in Random Controlled Trials). The Extremity Trauma and Amputation Center of Excellence (EACE) continues to coordinate efforts between BAMC, Walter Reed National Military Medical Center, and Naval Medical Center San Diego to advance care and incorporate outcome measures into daily clinical practice. Some EACE personnel work in the CFI. C&CC: Can you discuss other areas of achievements/focus? CSM Oates: Our MEDIC utilization program is designed to ensure that medical enlisted personnel assigned to BAMC are prepared at a moment’s notice to deploy and execute their wartime/combat medic [68W] skills. For many years medical personnel working in fixed facilities have not been utilized to their fullest potential. We implemented this program to establish a culture change. Our way forward is to utilize both the clinical environment as well as the simulated environment to ensure that medical personnel are prepared to perform their clinical skills in both the hospital and combat environment. Black badge – basic skills not validated on direct patient care knowledge. Silver badge – proficiency in knowledge and skills in direct patient care. Gold badge – proficiency in all knowledge and skills in the direct patient care setting, MEDIC Table VIII training, and the High Stakes Simulation training. BG Appenzeller: January 4, 2019 marked the one-year anniversary of the opening the military’s first Virtual Medical Center (V-MEDCEN) at BAMC. The V-MEDCEN began as a strategic concept in 2017 followed by hiring personnel and creating administrative structure to support operational and garrison virtual health. Key VH programs include the Advanced Virtual Support for Operational Forces (ADVISOR) phone line with a single phone number to support service members with eight specialties [including veterinary care] at the point of need when they have exhausted local military medical resources. ADVISOR also has a training line to support real world training in preparation for contingency operations. An operational program called ‘Mobile Medic’ enables 68Ws to screen and care for patients in field by connecting with a role II provider through VH platforms. The 68W presents patients using a tele-presenting kit and algorithm director troop medical care to reduce patient movement and to keep SMs in the field. The V-MEDCEN is working with the National Training Center and the Joint Readiness Training Center to integrate the Mobile Medic Program into rotational unit training scenarios, for real-world medical care, and to improve 68W competency. The V-MEDCEN, in collaboration with RHC-C, stood up a Virtual Health Care Coordination Application (VHCAA) to connect patients to providers at Military treatment facilities across the enterprise. VHCAA provides time-zone appropriate notifications to ensure the patient and the provider are in the right location at the right time for video appointments. BIRS has been providing telemedicine speech language pathology services since October 2009. Over that period, we’ve supported four distant installations, Forts Leavenworth, Sill, Redstone, and Leonard Wood; at one time or another, allowing patients to receive these services without having to travel away from their jobs and families. CSM Oates: Our main focus is to see our patients and provide them the best possible medical treatment. The ill and wounded do not care what uniform you wear. They require a service and we aim to give them the best possible healthcare experience here at BAMC. We truly live by the mantra “Our Family taking care of yours.” There is no other medical treatment facility at which I would rather work.